CM Cline in Dragon Magazine 184 (August 1992) presented The 7-Sentence NPC. Back then most of my NPCs either got a full page biography or a stat block. Over time I found moving to the middle ground the 7-Sentence NPC represents a handy tool. They have the advantage of being quick to read as a GM, quick to write and easy to improvise. Also over time my version has evolved from Cline’s original into my own beast. I never include gaming stats in the description – an appropriate stat block afterwards can include them if they are likely to be needed. I’ll use Graff Ansell, an NPC from a Venetian swashbuckling campaign I developed a few years ago, to illustrate the New 7-Sentence NPC. The title of the character block is always their Name and any titles, aliases or nicknames that may be relevant. The first line is the introduction to the NPC. I usually start with a pronoun or repeat their name. I also include their apparent gender, height, weight and build. If they have a distinctive feature I’ll include it here. I often use Describing a Character like a Spy for quick ideas for the description. He is a young man, tall of wiry build that looks like he could use a good meal and has a fencing scar across the left side of his face. Here I cover their occupation, history, family and nationality. If they are associated with a place or area I’ll include it here. Unmarried, originally from France he has plied his trade as a sword for hire in Venice for the last fifteen years. Many think he is merely in it for the adventure and the gold but Graff seeks revenge on the Venetian assassin who killed his father and the merchants who paid the bill. What is their personality? How do they interact with others? I’ll include any mannerism, accent etc it will finish off the line. He is slow and careful keeping his council to himself; he speaks quietly with a French accent. This covers things they know and are happy to talk about. He knows who is hiring swords in Venice, who is working for whom and who has a sword available for hire. What secrets do they know and how can a PC get them out of them? Graff may have been barely a teenager when his father was killed – he saw the killer’s face and the distinctive tattoo of the Order of Sile – he will share what he knows with anyone he trusts is seeking to bring the Order down. What are they good at? What are they incompetent at? Graff is a passable swordsman but his real skill lies in his capability with knives and daggers just don’t ask him to talk his way past a beautiful lady. He is a young man, tall of wiry build that looks like he could use a good meal and has a fencing scar across the left side of his face. 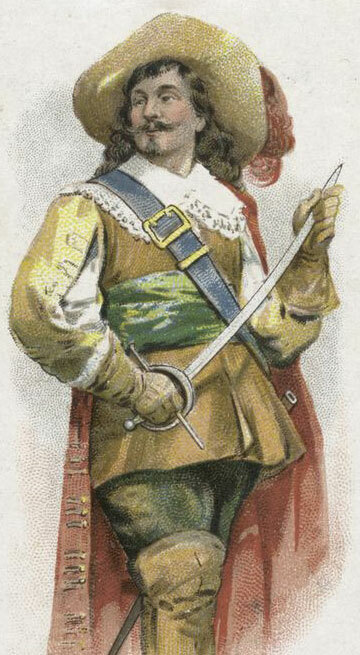 Unmarried, originally from France he has plied his trade as a sword for hire in Venice for the last fifteen years. Many think he is merely in it for the adventure and the gold but Graff seeks revenge on the Venetian assassin who killed his father and the merchants who paid the bill. He is slow and careful keeping his council to himself; he speaks quietly with a French accent. He knows who is hiring swords in Venice, who is working for whom and who has a sword available for hire. Graff may have been barely a teenager when his father was killed – he saw the killer’s face and the distinctive tattoo of the Order of Sile – he will share what he knows with anyone he trusts is seeking to bring the Order down. Graff is a passable swordsman but his real skill lies in his capability with knives and daggers just don’t ask him to talk his way past a beautiful lady.